Steampunk Chicago is pleased to present original DVDs and artwork for sale! We’ve done dozens of events and conventions over the past few years, and a DVD is available showcasing highlights from our adventures and productions. Not to mention, it includes a black-and-white silent film, Hard to Port! Our DVD makes an excellent choice for background visuals as well. Daria Melnikova is our resident videographer. View some of the videos on our video page. DVDs are available for $10! 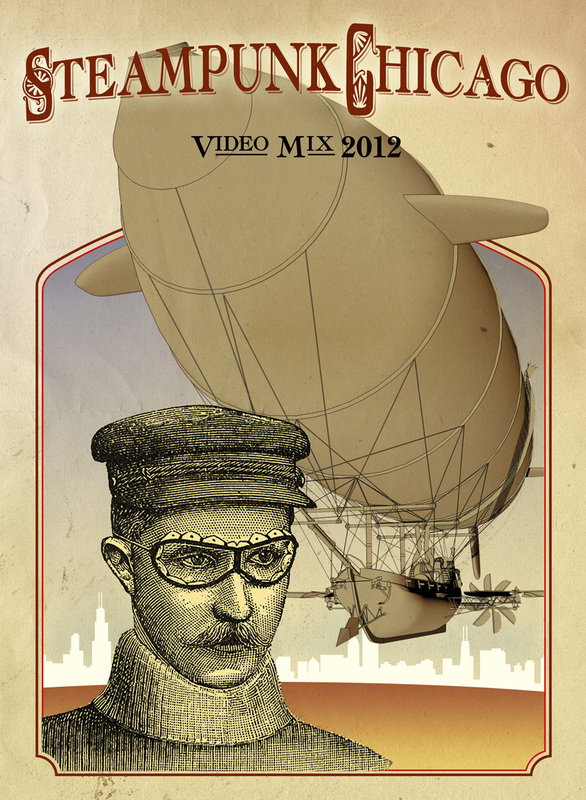 Help support our videographer and Steampunk Chicago. Steampunk Art, Posters, Prints and More! If you’ve been to any of our events, you’re familiar with our posters and fliers. A lot of work goes into designing out our steampunk graphics, buttons and imagery. Some of our more iconic images are now for sale, including new and original productions! Our art is produced by Sam Perkins Harbin, of Forge22 Design. He has provided select pieces for purchase at Cafe Press in a variety of mediums, including bags, steampunk t-shirts, and tiles.